Secrets of beauty have been cherished throughout the ages. One of the oldest beautifers known is Henna. Famous beauties such as Nefertiti and Cleopatra used Henna to enhance their hair colouring. Silent film stars Theda Bara and Clara Bow coloured their hair with Henna to add to their mystery. Today, Henna is used by both women and men. 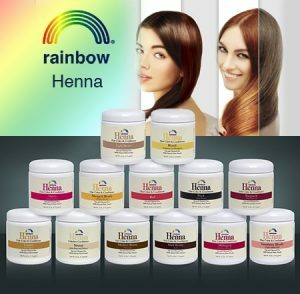 Rainbow Henna Hair Colour is 100% natural plant material–no additives, chemicals, preservatives, metallic salts or metals. Henna coats the outside of each strand of hair. The shade of Henna is reflected through the hair while enhancing your hair’s natural colour. The cuticle is smoothed by Henna’s sealing action, giving hair a polished look by making the light reflect off providing shine. Regular use of Henna can texturize the hair, giving it extra body–this becomes more evident with each application. Rainbow Henna colour will last approximately 4 to 6 weeks but is safe to use more frequently. and improving texture. *Note: Henna has no lightening action. ALWAYS test henna in a small area first to check the colour in a new batch of henna (and for allergic reactions if it’s your first time using henna) before applying to the whole head. Strawberry Blonde (Light Golden Red) Ingredients: Lawsonia Inermis (Red Henna), Cassia Obovata (Neutral Henna), Chamomile. Persian Blonde -Brightens and highlights* Ingredients: Cassia Obovata (Neutral Henna), Chamomile. Marigold Blonde (Golden Blonde) Ingredients: Cassia Obovata (Neutral Henna), Marigold Flowers, Chamomile. Black, Dark Brown , Medium Brown and Light Brown are also available in 1 Kg bags. All other colours can be special ordered if requested, please contact us for details. Persian Neutral Shines & Conditions. Your natural hair color seems brighter because hair has more shine. Instructions. How to Color and Condition with Rainbow Henna. I have been using the dark brown henna for a few years now to cover my grey. It does a better job than any of the chemical ones that I had used in the past. Once or twice a year I dye all of my hair and just touch up my roots every 3-4 weeks when my new grey comes in. I love it! It fades very naturally so my hair has many shades and highlights. If you can avoid washing with shampoo everyday, it lasts much longer. One day shampoo, the next day only creme rinse, it helps hold my colour and my hair doesn’t get too dry from all of the soap.